Ever been swept away by passion, love and the normal silliness that happens during that time? It's a wild and fun ride though the destination at the end isn't always pleasant. My drawing for Illustration Friday's theme: Swept. I was really really busy last week animating on a pilot, which will hopefully show later this year, and was not able to create my drawing for Illustration Friday last week where the theme was "Shadows". Though the concept isn't original, I really wanted to do this drawing so here it is! I do like drawing very cute characters and adding an evil element to them. Both illustrations are hand drawn and coloured into photoshop. I got sick last Wednesday while working on this job but continued to push on anyway, which was probably very silly on my part. I get a bit obsessive with work and I don't like missing deadlines. Ever. That said, I really must remember the importance of work and balance. So this weekend, though I did do a bit of work, I decided to rest up and do some of my own drawings, just for me. I really wanted to go to the gym too but that may be a bad idea since I have just recovered from a fever....hmmmmm.....so I had a big slice of chocolate cake instead and stewed apples in cinnamon and sugar. Definitely going to the gym later this week. Hi. Just browsing IF and came across your page. "Shadow" is fantastic! There's a real sense of movement and life in all your work. I like the way you interpreted swept and shadow! I really like your paintings! 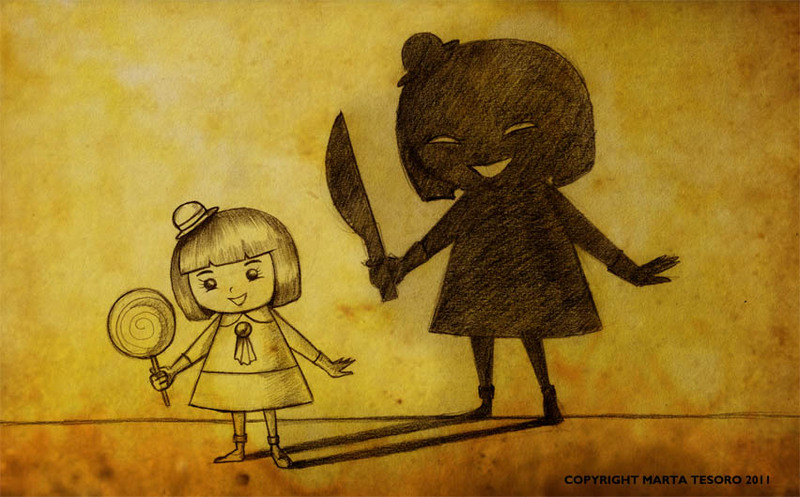 Oooo, your shadow illustration is deliciously e-vil. Heh. Oh, Marta! These are FANTASTIC! 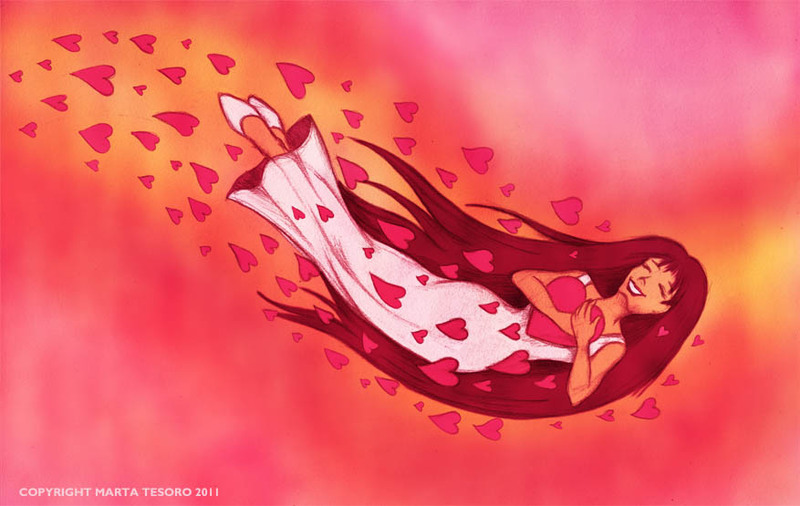 You certainly captured that feeling of being swept away by love. And HA!!!!!! to your shadow!!! Love the bit of evil. Mwahahahahaha! Love the colours in both pieces - and I like the hidden message in the Shadow piece. Hope you are feeling better. I've had a cold too. I think chocolate cake and stewed apples make a great remedy ;) Personally, I've been treating my cough with licorice allsorts. Congratulations on getting two done despite being sick. They're both wonderful! I really like the creepy cute shadow and the swept perfectly illustrates that word. Hope you're feeling better! wow great illustrations! I like how you used the hearts flowing with the lovely character. The shadow sketch is go good, too.